This image still kind of baffles me. According to the title on the negative this is a view on the Dotonbori canal in Osaka. But all other photographs of Dotonbori show a much wider canal and very different buildings. The scene on this image actually very much resembles images of Kita-Shinchi, Osaka’s famed entertainment area in the North of the city. If you happen to have information about this image, please do let me know. 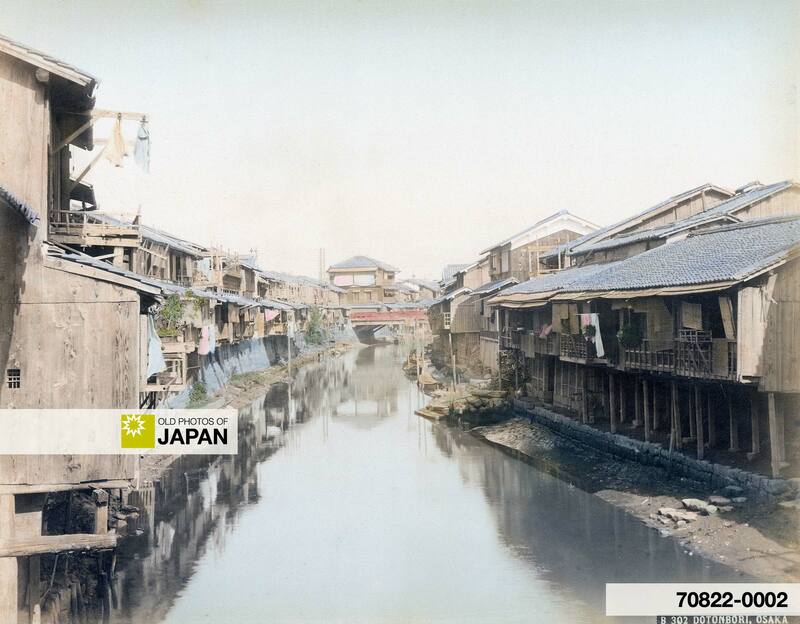 For images of the Dotonbori canal, see Osaka 1880s • Dotonbori Canal and Osaka 1890s • Ebisubashi Bridge. Quote this number when you contact us about licensing this image. You can also licence this image online: 70822-0002 @ MeijiShowa.com. Usage of this image requires a reproduction fee. NOTE: Your e-mail address is required, but will not be displayed.